This time last year I helped one of my best friends with her wine tasting bridal shower. 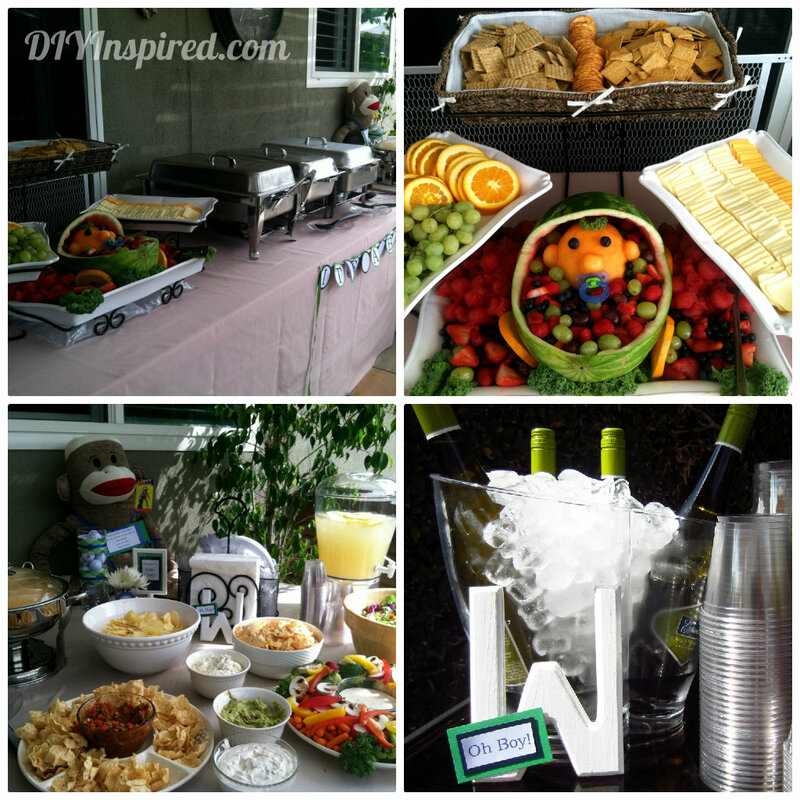 Almost exactly one year later, I helped co-host her baby shower! This baby shower, I’d have to say, was one of the most fun that I have helped decorate for to date. 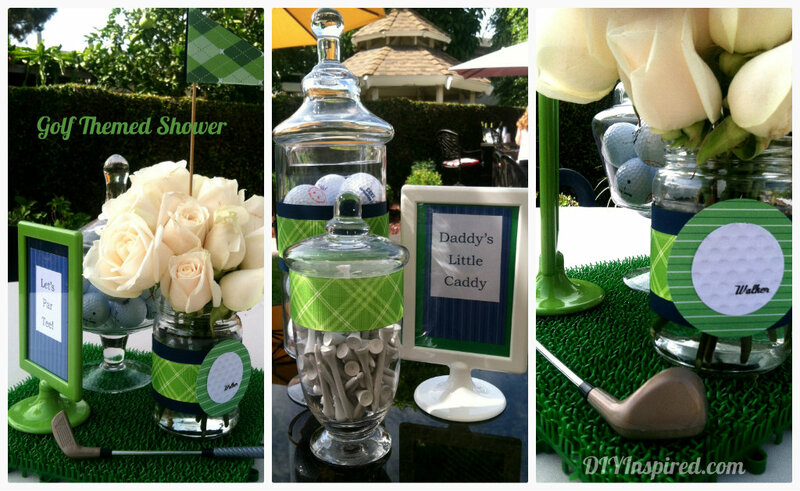 The Mommy-to-be requested a co-ed golf themed baby shower and that’s what we gave her! Let’s start with the ambiance! It was located at a family member’s house. Bushes meticulously trimmed and full of flowers, this back yard was the perfect setting. We rented three round tables with tan linen and used black chairs. The food was set up under the covered patio, and the bar was full with wine, a margarita machine, and a fully stocked bar. 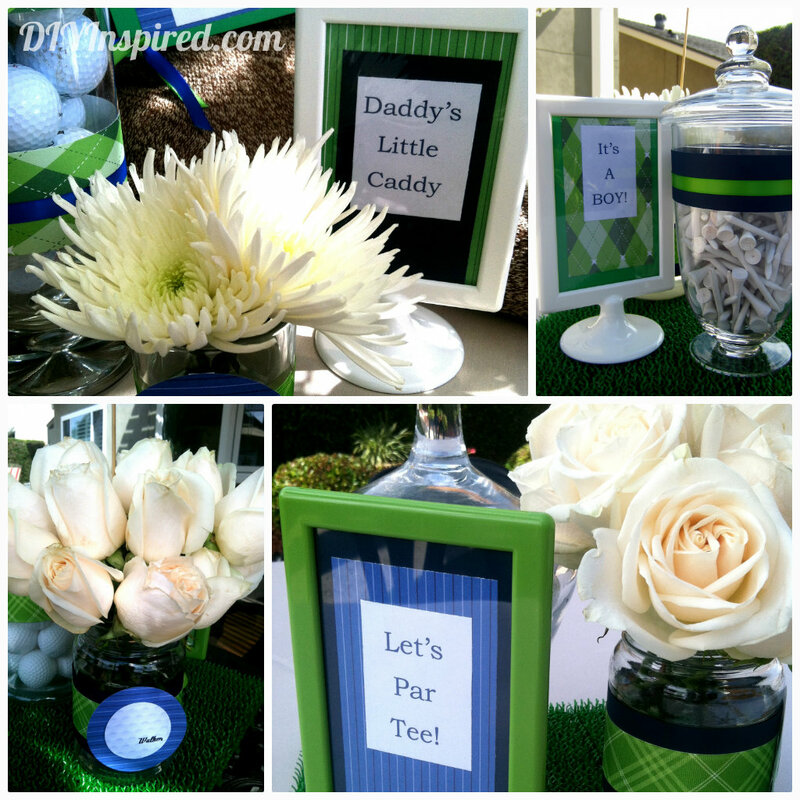 For the centerpieces, I used a plastic green “putting green” from my daughter’s butterfly garden party and filled ribbon trimmed apothecary jars with golf balls and golf tees . On my computer I made golf balls with the couple’s last name as the brand of the ball. I also cut and arranged fresh white flowers in recycled jars for some of the guests to take home. 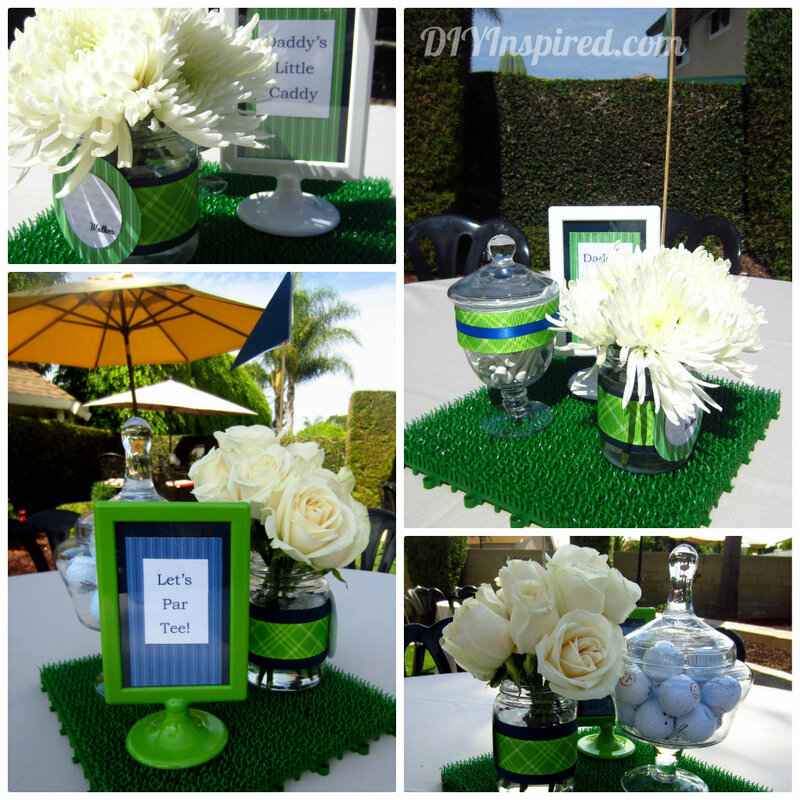 I made golf themed signs and made a flag to adorn the flower arrangement with. The food was done by the Mommy-to-be’s family. They made the most adorable fruit basket out of a watermelon to look like a baby in a carriage complete with a pacifier! We served delicious Mexican food, fresh fruit and vegetables, several dips, and cheese and crackers. For dessert we have cupcakes and three kinds of pie. 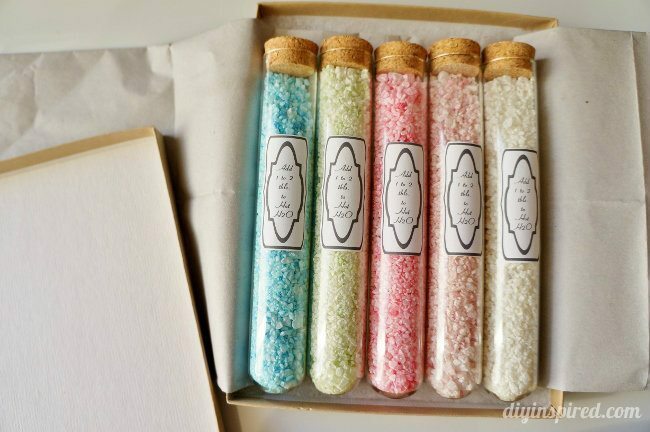 For the favors, I embellished small white boxes and filled them with Ghirardelli sea salt chocolates. I made a diaper cake and diaper cupcakes as the centerpiece. With ribbon and circle punch, I made a “congrats” sign. 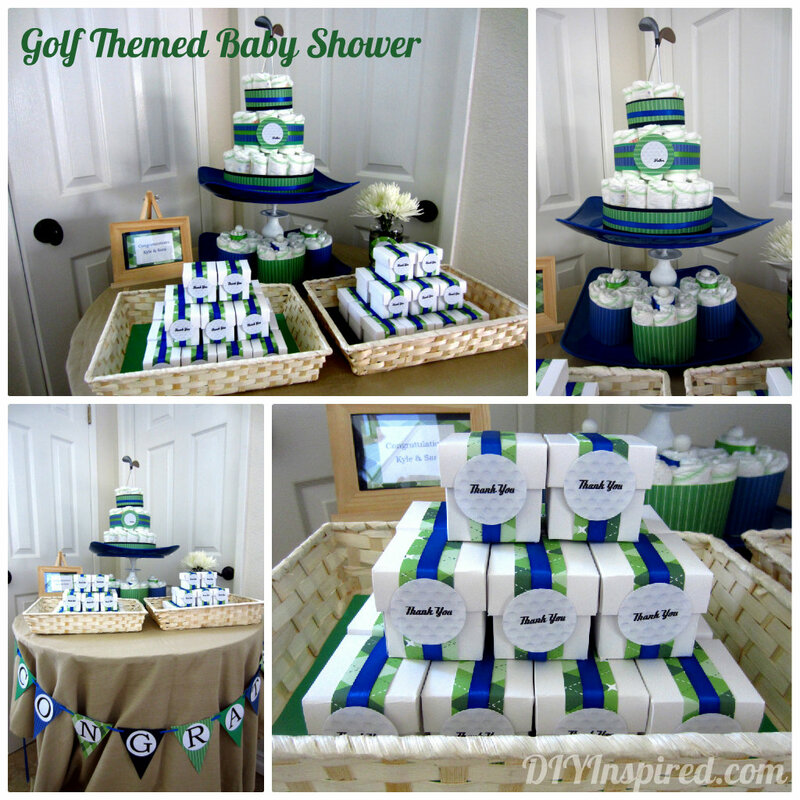 Hope you enjoyed this golf themed baby shower! It was a blast! 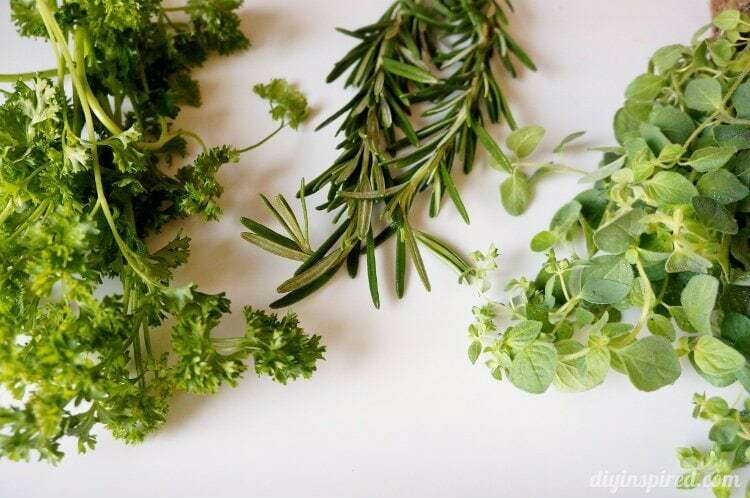 What did you use as the “grass”? Thanks! 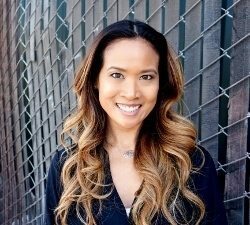 Hi Erin! I found these plastic grass mats at a Japanese dollar store called Daiso. It is similar to this: http://www.amazon.com/Plastic-Grass-Mat-Party-Prop/dp/B00BL4IX94 I hope this helps! Love all of the decorations where did you purchase the paper and holders for the sign.Daddy little Caddy! Great job on all. Hi Donna! Thank you! The frames I bought at IKEA for $1 a piece. The paper I purchased individually at Micheal’s Craft Stores. Hope this helps! Hi Sasha! 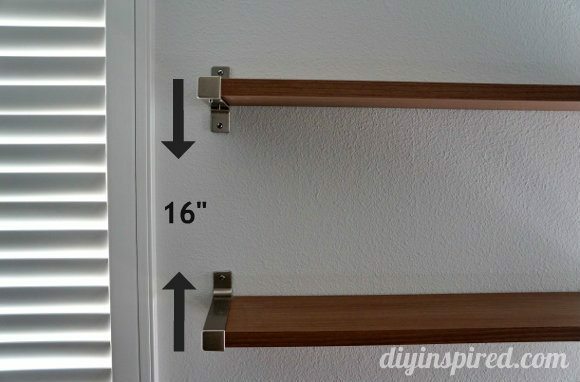 I got them at IKEA. They come in several different colors for only $1!